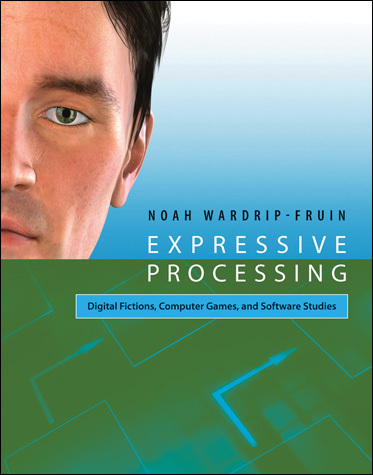 Noah Wardrip-Fruin has just published his first monograph, Expressive Processing: Digital Fictions, Computer Games, and Software Studies. As the subtitle suggests, his book is a software studies take on the past and future of digital fictions and games. As of today it's available in bookstores as well as online -- and a PDF of the introduction can be downloaded from the MIT Press site. Expressive Processing also marks the launch of the new Software Studies series from MIT Press, which Wardrip-Fruin is editing with Lev Manovich and Matthew Fuller. This book particularly develops a software studies for digital media, interpreting the computational processes of games and fictions (the ideas they embody, their histories, their potentials and limits) and connecting the specifics of these processes to the resulting audience experiences. Now that the series is launched, we encourage potential authors to contact the series editors and/or Doug Sery at MIT Press with proposals.